Karkala, June 28, 2015: Upa Lokayukta Subhash B Adi visited a stone crusher unit near Hebri on June 27, Saturday following a complaint from a local resident alleging that the crusher unit has caused damage to his land while also inconveniencing farmers and locals. During his visit, the Upa Lokayukta secured the relevant files from the Mines and Geology Department officials and inspected the same. He also pulled up the officials for remaining apathetic to the problem. The complainants Vadiraja Acharya and Alagoli Udaya Shetty were also present and alleged that the officials were ready to do anything provided they are bribed. During his visit, the Upa Lokayukta has warned of legal action against quarry owners if they were found guilty. The records also revealed that the crusher operated without any lease since December 2014. He also assured a thorough probe into the same. The locals on the occasion drew the attention of the Upa Lokayukta towards the fact that local roads, fertile lands have been damaged and houses have developed cracks due to the operation of the crusher unit. Meanwhile, the crusher owner Prasanna Sooda claimed that all records were straight and no injustice was done. He alleged that he was being threatened by underworld and that he should be given protection. 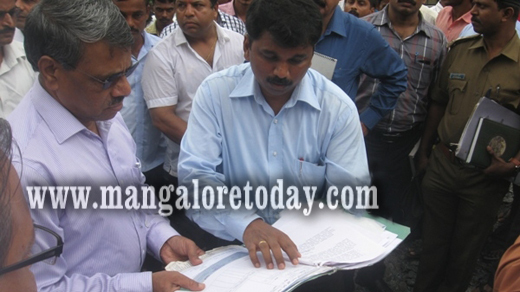 During the Upa Lokayukta’s visit, Suresh Shetty, former chief of Shivapura Panchayat placed forth a demand to close a nearby crusher unit named Mahalakshmi Stone Crushers, while the crusher owner Sudhaker Shetty said his records were in order. Kumar, Additional DC, HD Mendonca, Lokayukta SP of Udupi, Gopalkrishna Rai, Additional Registrar of Lokayukta, Vinay S Nayak, Karkala DySP, Chennappa Moily, Taluk Panchayat Executive Officer and others were present.